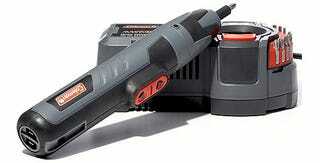 If you're like us, you might use a cordless screwdriver once a year, long enough for its charge to trickle away. But get this: The Coleman FlashCell Cordless Screwdriver will be ready for you in a jiffy, charging in 90 seconds or less. That's because it's not charging batteries, it's charging a large capacitor, sucking up the juice and getting you back to your screwing duties lickety-split (yikes, how many double entendres can I use in one sentence? ).